William M. Marsh, John Grossa Jr.
Environmental Geography combines traditional physical geography with a consideration of human-related environmental issues. This unique text emphasizes physical processes and systems, using the tools of geography, such as maps, to convey information. 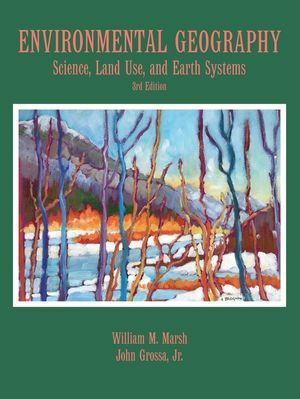 William M. Marsh is the author of Environmental Geography: Science, Land Use, and Earth Systems, 3rd Edition, published by Wiley. John Grossa Jr. is the author of Environmental Geography: Science, Land Use, and Earth Systems, 3rd Edition, published by Wiley. A continuing theme of sustainability, with more emphasis on efforts by governments, corporations, private organizations, and individuals that are showing promise in bringing us into balance with the planet. 16 new case studies, 12 of which deal with sustainability issues. A revised organization. The first five chapters have been rearranged to provide a better flow of topics from issues and perspectives, to environmental foundation material, to factual matter on the condition of earth and its people. New material in several chapters, including the increasing role of NGO's in working out solutions to environmental problems from the global to the local level. Thoroughly updated statistics on population, energy, and food production. Revised graphics, including dozens of new photos. · Environmental Geography is written at the appropriate level for undergraduates providing a good introduction to the key topics. Instructors can choose which topics they would like to emphasize and explore in greater detail with students. · The first edition of this title was praised for its strong coverage of policy issues including laws, regulations and international agreements. · The author has written the text from a uniquely geographic perspective. Emphasis is on the spatial aspects of environmental use and abuse. · A comprehensive glossary provides students with an excellent reference for key concepts.